Lander, that friendly down to earth town just over the mountains, offers a fun time for anyone seeking an outdoorsy thrill. The climbing and backpacking scene have been thriving for a while but mountain biking is really starting to take off. Over the last several years the Lander Cycling Club (LCC) has been hard at work improving existing trails and building new ones. Bikers are becoming a common sight along many area trails. It is still a bit Wild West in some areas but the area bike shops, The Bike Mill and Gannett Peak Sports, are always happy to point a new comer in the right direction. The weather in Lander is milder than most of Wyoming. The biking trails in some areas have been dry since March and road biking is an option almost year round. You may have to bundle up more in the early spring but that is a small price to pay for swooping single track and dry dirt. While there is no guidebook to Lander trails, there are maps of almost every area with many trails on mtbproject.com and on The Bike Mill's site. The Bike Mill regularly posts trail conditions on their facebook page and twitter feed. If you have yet to visit MTB Project, or download their app, it is well worth it for connection to a nationwide network of trails. Lander boosts several distinct biking areas with their own unique flavor. The most developed and user friendly of Lander's riding areas. Located 15 miles southeast of town this area boasts an improved parking lot and an informational kiosk. All the trails are marked by name and difficultly. The single-track weaves around high desert sage and a juniper dotted landscape with vistas of the Wind Rivers and picturesque views of red slick rock. The waterfall is a unique feature and seems out of place with the high desert sagebrush landscape. Trails range from beginner to intermediate and can be looped together via a variety of single-track connectors or two tracks. Wonderful in the spring and fall or early in the morning during the summer. Popular with the free ride and downhill crowd this trail offers big jumps and fast paced, technical single track. The upper half offers fast and flowy banked corners and jumps while the lower canyon section challenges even the most skilled riders with its tight nature and technical obstacles. Mostly run as a shuttle, some riders opt to grind up the two track but it is not recommended to pedal up the trail. The top section is great early season. The bottom takes a bit longer to dry out but is usually rideable by mid to late spring. More wild west than Johnny and reminiscent of the Moab slick rock riding, this area is 5 miles west of Lander. There are no trail signs and no delineated parking lot, just unmarked, unpaved pull offs. The Bus loop, while not as manicured as Johnny, is still super fun and offers more technical challenge due to the rapid terrain changes. The two tracks within the Bus are non motorized and link the many single-track sections together. Cactus, cool slick rock features, and stunning views of Red Butte and the Lander foothills abound. Portions of the Bus can be sandy in the summer so this area is best enjoyed in the spring and fall. The Canyon is very different from the other areas. Trails are nestled along the Popo Agie River and dance along the Canyon rim. Wooded and cooler than the high desert riding, this is the summer area of choice. The trails are rockier than the other areas and thus a bit more technical. The lower canyon, mostly called the Warming Hut Loops, can be ridden in the late spring but the higher elevation trails need the warmer weather for riding. 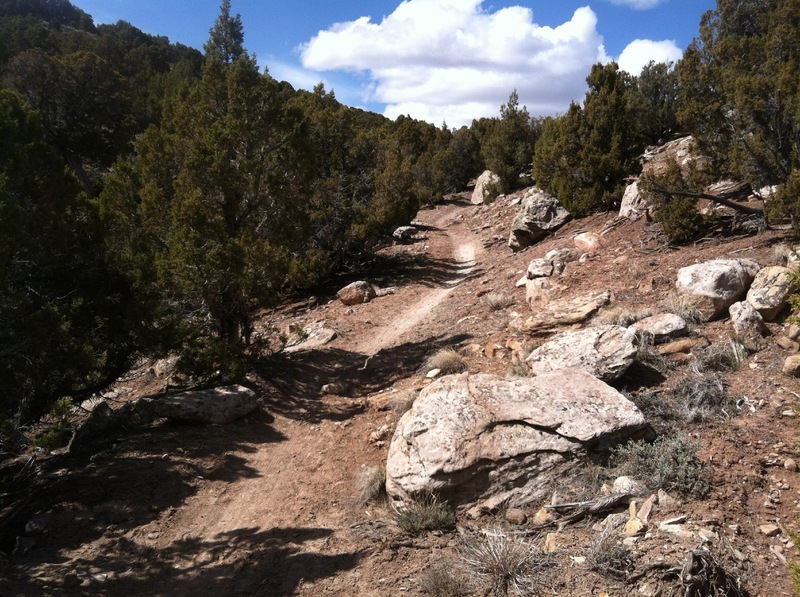 Sinks offers a wide variety of trails, everything from mellower beginner single track to a 9 mile technical ride offering fast, rocky, downhill stretches that is most often shuttled. If you want an epic day of riding, Sinks in the place. This is just a taste of the biking scene in Lander. For more information call or email one of the local shops and get the rundown. While you are biking in the Lander area, do not forget to spend some time in town. Lander has many unique shops and restaurants. Offerings range from burgers and beer, to sushi and sake for that after ride hunger. Bring the pooch, Lander's biking trails and camping areas are all dog friendly.